Modern vehicle architectures are expanding to include Ethernet and CAN FD in addition to existing CAN and LIN networks. 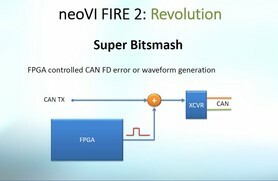 The neoVI FIRE 2 provides Ethernet, eight channels of CAN (including CAN FD) and four channels of LIN in one tool. All channels run simultaneously and are time-stamped in hardware. A fully-isolated high-speed USB interface allows messages to be sent and received without risk of damage to the PC. 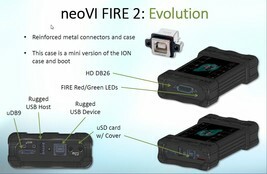 neoVI FIRE 2’s predecessor, the original neoVI FIRE, was very successful. While the neoVI FIRE 2 has been developed primarily to provide new vehicle networks and features, it also includes significant improvements to existing features. These include the following: 1) a more robust metal case and connectors, 2) 1000 times larger script space, 3) the ability to off load the SD Card from the PC, 4) the ability to power the device from USB during configuration, 5) support for a larger voltage range, and 6) expanded voltage range on MISC IOs. neoVI FIRE 2 offers 8x CAN channels with 6x dedicated CAN-FD and 2x CAN with 3 software selectable PHY options (2x LSFT / 2x SWCAN / 2x CAN-FD). neoVI FIRE 2 also features 4x LIN / ISO9141 channels and 1x Automotive Ethernet port providing DoIP and XCP over Ethernet capabilities. 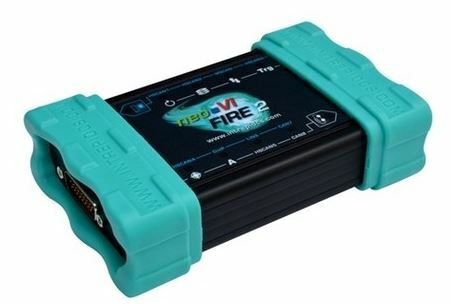 neoVI FIRE 2 is capable of processing receive and transmit activities on all available channels simultaneously. Intrepid’s Vehicle Spy software fully supports the neoVI FIRE 2. 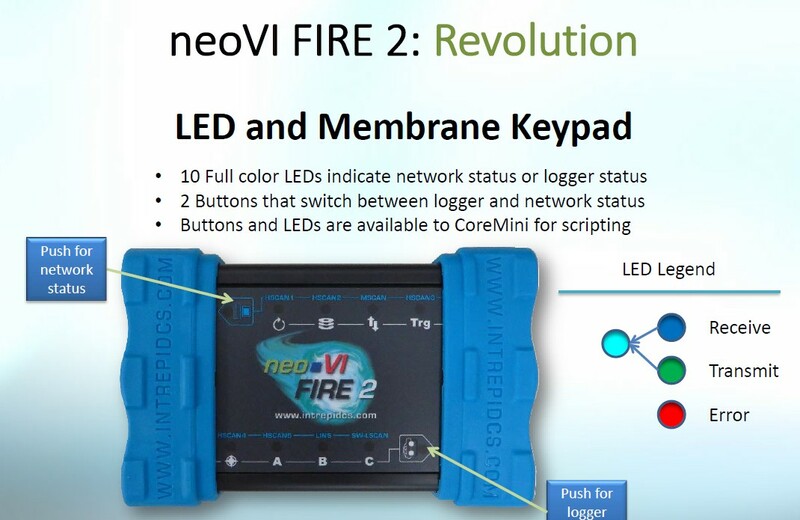 With Vehicle Spy, users can monitor and transmit on all neoVI FIRE 2 networks simultaneously. Vehicle Spy is required to configure standalone mode. Users can take advantage of the powerful interface to load databases and to write and debug scripts before downloading them to the device. Since some users prefer to write their own software, neoVI FIRE 2 supports three open APIs: neoVI DLL API, SAE J2534 API, and the TMC RP1210 A/B API. The neoVI DLL API includes examples for all popular development environments including C#, VB. NET, VB6, Delphi, C++ Builder, Visual C++, LabVIEW, and LabWindows. Examples and drivers for Linux are also available. There is also an API to allow 3rd parties to license their applications using neoVI FIRE 2 as a secure hardware key. 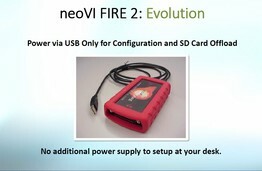 In addition to working as a PC interface, neoVI FIRE 2 supports operating in stand-alone mode. In this mode, neoVI FIRE 2 can run real-time scripts, log data to a removable microSD card, and simulate ECUs and gateways. With these features, it is possible to run a script to reflash ECUs using the data from the microSD card. 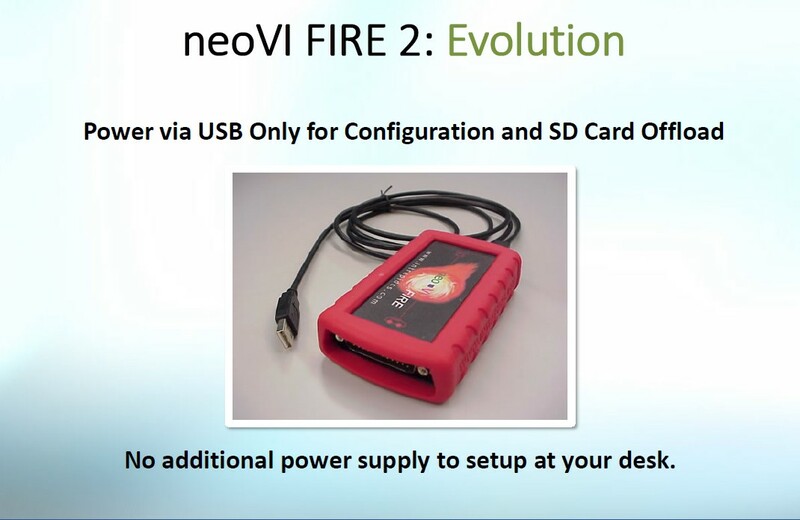 neoVI FIRE 2 is capable of logging to a removable microSD card. This logging feature includes a real-time, fail-safe FAT32 storage system. neoVI FIRE 2 also has a real-time clock for hardware timestamping all messages. 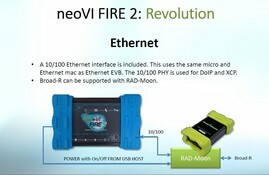 Finally, a robust power management system automatically powers down neoVI FIRE and can wake the device again based on network activity or PC connection. The neoVI FIRE 2 includes a real-time scripting engine that can be used to perform real-time messaging. For example, an engineer creating an application can load a script into the hardware and interface with the script variables, allowing microsecond-level measurement and control. Through a new feature called hardware acceleration, Vehicle Spy can also be configured to send real-time functions to the device, such as periodic messaging, replay, or scripting. The neoVI FIRE 2 was designed to fully support the latest vehicle network requirements for most OEMs including GM Global B. Intrepid believes that neoVI FIRE 2 will provide the scalability, reliability, and capability needed by OEMs to cover a wide range of vehicle network applications. 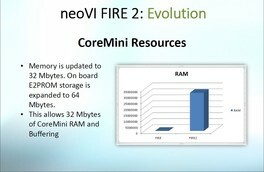 neoVI FIRE 2 의 CoreMini Function Block 스크립트 용량은 기존 neoVI FIRE 보다 1000배이상 증가하였습니다. neoVI FIRE 의 경우 하드웨어 세팅 및 SD 카드로부터 데이터 추출등의 기능을 수행하기 위해 12V 전원을 입력해야만 했습니다. neoVI FIRE 2 는 USB 전원으로 이 모든 것을 해결하여 편리함을 제공합니다. 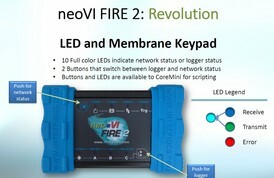 neoVI FIRE 2 는 사용자가 물리적으로 입력할 수 있는 Membrane Keypad 버튼이 제공됩니다. LED 상태 표시또한 더욱 업그레이드 되었습니다. 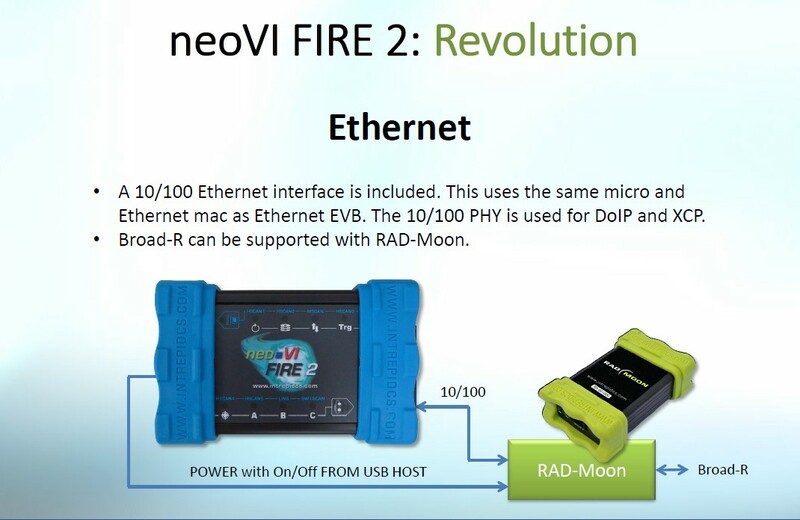 neoVI FIRE 2 는 10/100 Ethernet PHY 를 통해 XCP 및 DoIP 등을 지원합니다. 또한 10/100 Ethernet 인터페이스에 RAD Moon 미디어 컨버터를 연결하시면 BroadR-Reach 에 연결하여 BroadR-Reach 모니터링, 데이터로깅, 시뮬레이션 등등의 기능이 지원됩니다. 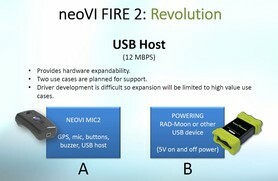 neoVI FIRE 2 의 USB 단자를 통해 다양한 주변기기 연결이 가능합니다. neoVI FIRE 2 는 Super Bitsmash 기능을 제공합니다. Super Bitsmash 를 통해 CAN FD 에러파형을 생성하여 에러 시뮬레이션이 가능합니다.